Showing plenty of promise in its initial release, with some improvements and refinements, One DJ could be a hit. Timeline Edit concept is great. Generally stable. Affordable. Modular design. Full screen module toggling. No undo or third party plugins. Work in progress. It's been a while since anything totally new hit the world of digital DJing, so when Audio Artery announced One DJ (originally called The One), trumpeting features like the ability to remix on the fly and a modular interface, we were certainly intrigued. Now that it's here, though, can it live up to the hype and find a live performance niche among the likes of NI Traktor and Ableton Live? "Imagine if the individual playback decks featured mini arrange windows, each hosting multiple tracks - that's One DJ's killer feature"
Just reading the marketing material, it's quite difficult to work out what One DJ actually is, so here's our take: imagine if the individual playback decks in the likes of Traktor or Serato Scratch featured miniature arrange windows, each hosting multiple tracks. That's One DJ's killer feature. Beyond that, in most other respects it can be thought of as a typical DJ application (iTunes library support, mixer, decks, effects, looping, cueing, etc). One DJ is entirely modular in nature. You can call up as many decks/Timelines (we'll explain these shortly) as you want, route them to as many effects modules as required, run multiple instances of the same effects module in series, route one deck to one output and another to another by simply dragging virtual cables, and more - and all of your active modules can be placed wherever you like onscreen. The signal flow is made very clear using colour coding that runs from deck to mixer for each deck - even the waveforms are colour coded - and you can also blow any module up to full-screen and back via a keystroke, which is an ingenious feature that we'd love to see incorporated into just about every piece of music software we've ever used. So, how about that per-deck multitrack setup? It's called Timeline Edit mode, and it enables you to, for example, load an instrumental and an acapella (automatically timestretching both, of course) into the same deck, trigger them as one, and edit them independently on the fly. "You can navigate around tracks and perform edits without affecting playback"
You can navigate around tracks and perform edits without affecting playback. For example, if the crowd don't like the first breakdown in your currently playing track, simply jump ahead and chop out the second one while the track rolls on. You can also fine-tune the beat grid for tracks with dodgy timing, using the same zplane-developed, high-quality warping technology found in Ableton Live and many other DAWs. Timeline Edit mode is quite an interesting concept - and surprisingly easy to use with a bit of practise - but it's not without its problems. First, without an undo function (scheduled to be added), it can be maddeningly frustrating, especially when adding automation (only available for volume and EQ, currently, but hopefully expanding to at least the other built-in effects soon). Second, it lets you drop one clip directly on top of another in a deck, so that both play together; but it can be very difficult to see small audio files covered by larger ones, leading to potential sonic disasters when playing live. There are also a number of promised (or hinted at) features that have yet to materialise, including "limited support for third-party plugins". The onboard effects (Reverb, Delay, Bitcrush, Stutter, etc) do the jobs required of them well enough, but third party support definitely feels like something that needs to happen sooner rather than later. 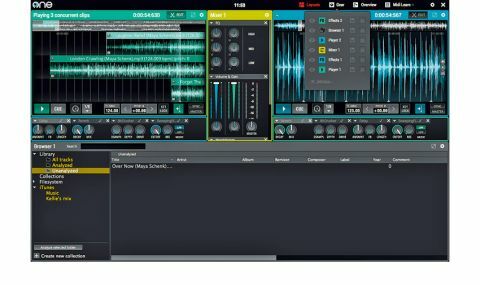 As well as those workflow issues and pending features, there are a few other oversights in the current version of One DJ. The biggest is that all clip analysis info (tempo, cue-points, etc) is stored in a separate file for each clip, kept in the same folder as the referenced audio file. This means you have to take much more care when organising your music than should really be necessary (Live suffers from the same problem). These files should be saved to a separate database folder that can be easily moved from computer to computer - something Audio Artery says it's working on. Another forehead-slappingly odd development decision is the placement of the Effect Remove buttons next to Effect On/Off - click with care! Finally, while One DJ was generally very stable throughout the testing period, we did encounter two crashes, both while switching between layouts during playback - and without a recover facility, we couldn't just relaunch from where we left off. This was on a Core 2 Duo Mac, however, and Audio Artery point out that the PC version is on a later release version, and that i-series processors are recommended for Mac use. We're not entirely convinced by either of those explanations, but hopefully this minor problem will be ironed out in an update. "One DJ is a brave, innovative release and we'd love to see it do well"
If this is reading like a negative review, we really don't mean it to. What is here is quite excellent: One DJ is a brave, innovative release and we'd love to see it do well. Only time will tell whether or not it evolves into something sufficiently different and superior to really capture the imagination of the world's laptop DJs, but this first version is certainly full of promise. We wouldn't recommend ditching Traktor, Scratch, Deckadance or Live just yet, but we would advise NI, Serato, Image-Line and Ableton to pay attention to what Artery are doing. Then there's the price: at just €49+VAT, One DJ will be very appealing indeed to those on a budget. We look forward to seeing where it goes next.